To lose one’s sight as one gets older seems terribly cruel. Can you imagine not being able to enjoy a painting? Or missing the splendour of February’s first crocuses? Or not being able to see your first grandchild? Earlier reports found that Lutein supplementation significantly improved several cognitive functions, namely verbal fluency, memory scores and efficient learning, in older women. More recently, it’s been found to improve memory and reasoning ability. I definitely need some of that! Other studies suggest that lutein can help build stronger bones. Studies in vitro and on mice show the possible role of lutein in building bone mineral density, a finding reflected in a few observational studies (I’ve recently been diagnosed with osteopenia so I need that too). Not every study has found the same result (which is the nature of research), but there’s now a large and robust enough body of evidence to suggest that we’d all benefit from more lutein in our diets. You can read the latest lutein literature review here. So how much lutein should we have and how best to consume and absorb it? Supplementation appears safe, but with mounting evidence suggesting that supplements often don’t work and can – occasionally – be toxic, we’d suggest focussing on diet. A December study from Sweden shows us how best to do this. Our bodies can’t produce lutein. We have to find it from food. Eggs contain the most bioavailable lutein (the easiest for our bodies to absorb), while sweetcorn appears to be one of the richest sources. But green leaves are almost as good, contain many other vital phytonutrients and are readily available at this time of year. Look out for chard, spinach, dandelion leaves and watercress. Anything leafy and green – lettuce, kale, parsley etc – is a good source. How we prepare and cook our green leaves is very important when it comes to maximising lutein. The Swedish researchers ran a series of experiments using spinach. They found that the longer spinach is boiled, the less lutein it retains. The cooking method is also important: when spinach is fried at high temperature a large fraction of the lutein is degraded after only two minutes. Spinach simmered in soups and stews retains more lutein than spinach cooked in a lasagne at high temperature. They also found that reheating spinach in a microwave enabled yet more lutein to be released – its plant structure is broken down further when microwaved, apparently. Good news for those of us with a penchant for leftovers. 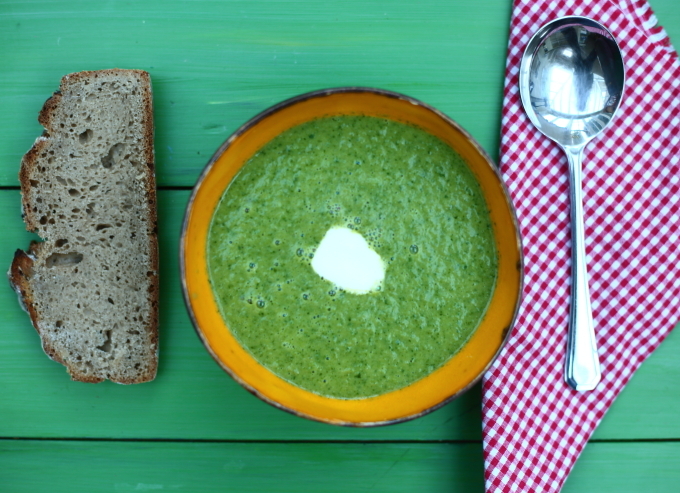 This simple, scrumptious and super-fast soup contains lots of fibre and uses raw, chopped greens (I’ve used watercress, but spinach would be fine too). A swirl of cream or yogurt provides the fat needed to make the lutein as soluble as possible. The anchovies add a little Omega-3. Fry the onion, garlic in the oil. Add the anchovies and stir for a few seconds. Add the beans, salt and water and when the water is just boiling add the watercress. Leave the heat on for a couple of minute so the watercress just wilts. Whizz in the blender. Serve with a swirl of cream, crème fraiche, yogurt or olive oil, a good squeeze of lemon juice and a vigorous grind of black pepper. I just LOVE the posts on your AGE-WELL PROJECT; always informative …and so very tasty. We’re really enjoying ageing well with you guys 😄!! Thanks, Dawn – that’s very kind!